Lancia Works, Alperton, London in 1938. Homepage. This page: An invoice referring to spare parts sold for a Lancia motor-car in the 1930's. In 1938 Messrs. Fisher Firth & Co. Ltd., of Cellars Clough Mills in Marsden, ordered a number of new exhaust parts to suit a 1930's Lancia motor-car. 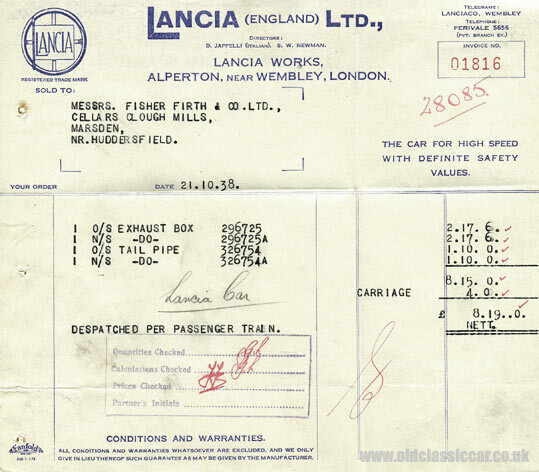 Unfortunately the specific model name isn't given, but the part numbers would have been sufficient for the gents of Lancia (England) Ltd, of Alperton in London, to dispatch the correct parts, by passenger train, up to Huddersfield. The fact that nearside and offside exhaust parts are specified, hints at a 'V' engine. The Lancia Augusta of 1933 - 1936, for instance, had a V4 engine, as did the sporting Lambda, and the Artena, whereas the Astura had a V8 as standard. The Lancia Works was located in Alperton, in London, the two directors are given as D. Jappelli (Italian) and S.W. Newman. The company slogan: "The Car For High Speed With Definite Safety Values" also gets a mention on this invoice from 1938. Fisher Firth & Co. produced woollen garments from the Cellars Clough Mills, presumably therefore the Lancia was a company car.